No cross-reactivity against mouse IFN-β, mouse IFN-γ, rat IFN-α1, or IFN-α14; very weak cross-reactivity with human IFN-α14. The VeriKine-HS Mouse IFN-α ELISA kit has been developed to quantitate low levels of IFN-α in mouse serum, plasma and cell/tissue culture media (10% FBS) using a sandwich immunoassay. 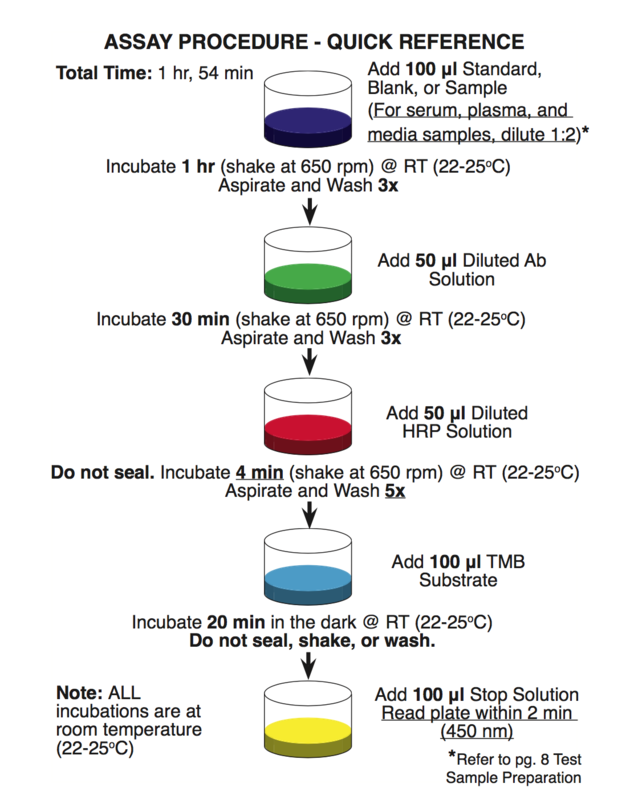 The kit contains an anti-mouse IFN-α detection antibody conjugated to biotin and quantified by streptavidin horseradish peroxidase (HRP) using tetramethyl-benzidine (TMB) as a substrate. 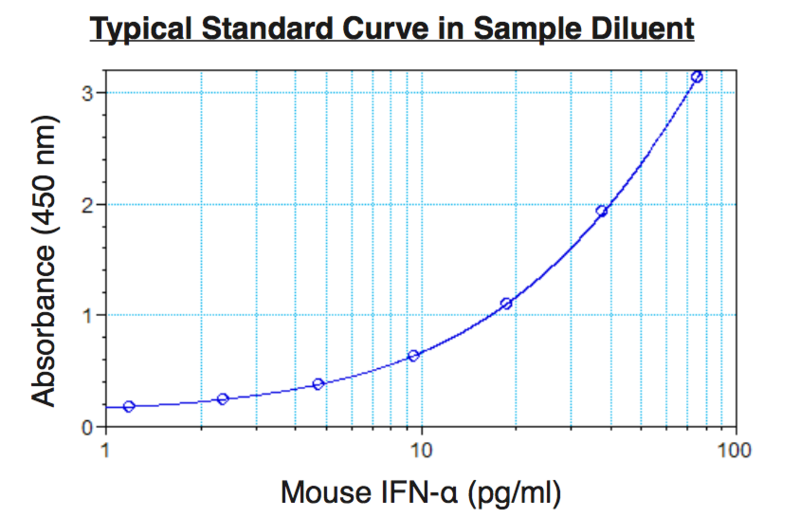 The kit standard is mouse IFN-α 4 protein, and typical standard curves are included with the procedure. It is important to run the standard curve in the same matrix as one’s samples unless one has demonstrated that the matrix does not significantly affect the signal. Interferons (IFNs) are an extensive set of cytokines exhibiting pleitropic activities and playing major roles in both innate and adaptive immunity. The Type I IFNs genes consist of multiple IFN-α genes, at least one IFN-β gene in most vertebrates, and a few other family members including limitin in the mouse and IFN-ω and -ε in mouse and human. In the mouse, fourteen (14) IFN-α genes have been cloned which exhibit at least 75% identity at the protein level. In the therapeutic setting, IFN-α is used to treat viral diseases and certain cancers, and is therefore frequently studied in mouse and other animal models of these diseases. Several lines of evidence indicate that IFN-α proteins may be involved in the development of specific autoimmune diseases, and that treatment with IFN-α blocking antibodies may comprise a useful therapeutic strategy. Expression of interferon genes (and therefore, proteins) is regulated by a group of interferon regulatory factors, i.e., the IRF family of proteins. Cellular levels of IRF3 and IRF7 regulate the expression of individual IFN-α subtypes with most IFN-α subtype genes requiring IRF7 for expression. IRF7 protein is either constitutively expressed or inducible, depending on cell type. 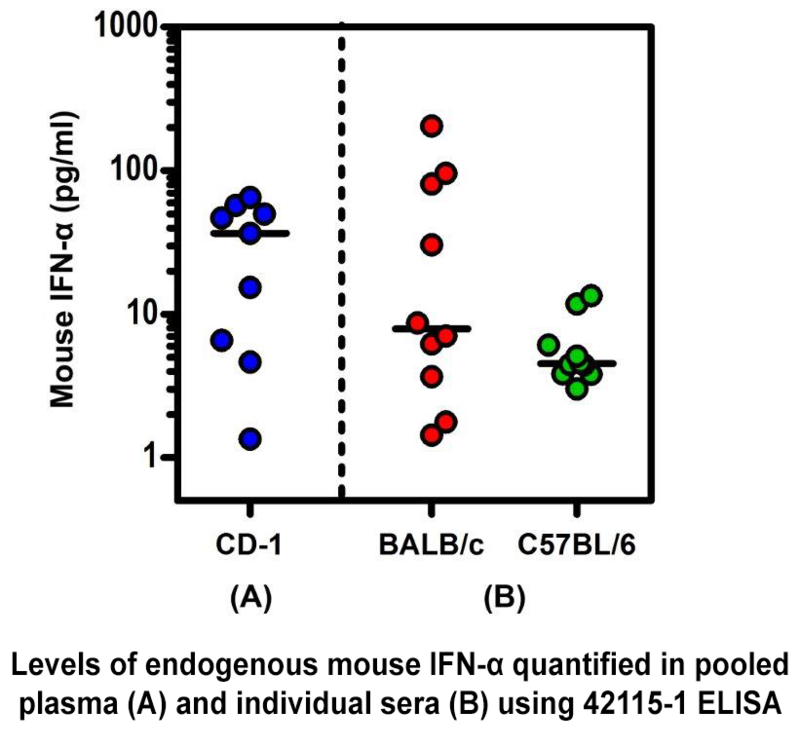 In certain mouse cell lines, IRF7 expression is induced in particular by at least IFN-β and IFN-α4 which then leads to expression of the other IFN-α subtype genes. Additionally, murine IFN-β may be requisite for fibroblast synthesis of IFN-α but may not be requisite for other cells’ synthesis of IFN-α. The IRF3/IRF7 signaling cascade is a focal point for initial and progressive cellular responses to pathogens where hundreds of genes are subsequently regulated in a temporally coordinated cascade. Plasmacytoid dendritic cells (PDCs) are highly efficient producers of IFN-α, but a wide variety of cells can also produce lower levels of these protein subtypes. The particular IFN-α subtype genes that are expressed appear to be somewhat cell and stimulus specific and, based on the results published from several gene induction studies, the time courses of induction of the individual protein subtypes are expected to differ markedly. Krause et al. (2005) Pharmacol Ther., Vol. 106; Issue 3; 299-346. Chevaliez and Pawlotsky. (2009) Handbook of Exp Pharmacol. Vol. 189; 203-241. Antonelli. (2008) New Microbiologica. Vol. 31; Issue 3; 305-318. Ascierto and Kirkwood. (2008) Journal of Transl Med. Vol. 27; 60-62.